Most experienced traders have developed a catalog of models based on different approaches and market conditions. That wealth of options can lead to trading paralysis if you don’t know which model to choose for trading the current market. NeuroShell Trader can assist with that decision. The first two models used the same inputs and functions but different types of genetic algorithm optimization. The third model added lagging variables as an option. While lagged versions of inputs don’t appear in the final model, they influenced how the model evolved. You can add ChaosHunter models to NeuroShell Trading Strategies using built-in indicators from the External Program & Library Calls indicator category. The formula and threshold are integrated into the ChaosHunter Signal version of the indicators so the conditions they represent are either true or false. NeuroShell Trader chooses which model to trade if you select “Rule Selection Optimization”. Note that you don’t have to choose Full Rule Optimization because ChaosHunter performed that part of the optimization work. The three ChaosHunter models are listed as trading rules on the Long Entry tab. The Short Entry Signals are listed on the Short Entry tab. The ChaosHunter model was trained as a reversal system. 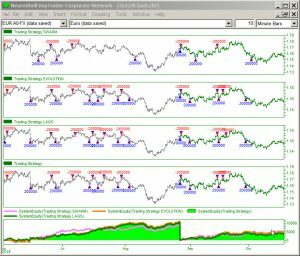 The NeuroShell Trader chart below displays the trading signals for the three different ChaosHunter models at the top of the chart. The equity curve in light green for the Trading Strategy at the bottom of the chart displays the results when NeuroShell Trader was allowed to pick the model to trade. Note that even though the trading rules said to trade when two of the three models were true, the optimizer only chose one model to meet its objective of Maximize Return on Account * Equity Curve Correlation. 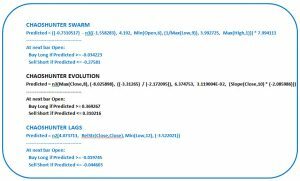 Click here to download the chart, all three ChaosHunter models and the datafile used to build the ChaosHunter models. Copy the ChaosHunter model files eur a0-fx evolution.md, eur a0-fx swarm.md, and eur a0-fx Lags.md to your c:\NeuroShell Trader 7\template directory before opening the chart. To learn another approach for selecting models, look at the August 2018 newsletter. Our tech support website includes a forum where you can chat with other NeuroShell Trader users. Share your trading ideas or ask for advice. Posts appear immediately, so you don’t have to wait for a forum administrator to approve the post. The first time you access the forum, you have to create a user name and password. Note that this is different than your NeuroShell Trader serial number and password.